If there is an award for boat builders that think outside the square, Quintrex should win it hands down. Not satisfied with simply being the biggest aluminium boat builder in the southern hemisphere, this tinnie building giant continues to bring the market new innovations. This time it’s in the form of a 6m plate-aluminium boat aimed squarely at the offshore fishing market. Quintrex hasn’t built a boat this big since the sad day when the old Yellowfin model slipped from its range. But as great as these boats were in their day, there’s precious little of those old Yellowfins evident in this new boat. This new vessel is definitely a Quinnie. 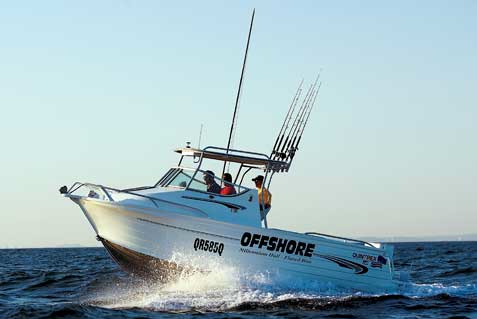 But one noticeable characteristic missing from the 650 Offshore is Quintrex’s trademark flared bow. Perhaps their marketing folk decided that a big plate tinnie that looked like a big plate tinnie would be more acceptable to alloy enthusiasts. Nevertheless, a Quinnie without a flared bow seems a bit like someone wearing their best shoes without socks. But what the 650 Offshore does have is Quintrex’s revolutionary Millennium Hull, which has some flare between the chines and the keel. But putting traditional sentiments aside the boat certainly rides well and could never be accused of being a wet boat. The first impression this boat gives is one of size. For a tinnie it’s big, bloody big. Heading out towards Moreton Bay’s notorious Jumpinpin Bar the 650 shows just how stable she is. The bar is a mess of clear green gutters running between the breakers creating ideal conditions to put the 650 Offshore through its paces under. Unfortunately, there’s a problem with the motor height that is slowing proceedings considerably. It’s easy to rectify back at the shop, but out here, forget it. At least bobbing about in these green water gutters, with breakers all around, shows us how well the 650 Offshore’s high gunwales keep the white water at bay (pardon the pun). Being so big it’s an easy boat to gain confidence in. And the four big scuppers, that quickly remove any wet stuff from the self-draining deck, further boost this confidence. The brand new 200hp Yamaha four-stroke outboard on the back of the test boat responds well, spreading its power across the entire rev spectrum. The big Yamaha has a top speed just under 37 knots, but it’s in the low and mid torque ranges that she impresses us the most. In a straight line the rig planes at around 10 knots, displaying no fuss during the transition from displacement speed to up and planing. Running back to the ramp the fuel flow meter – Yamaha supply with their big outboards – tells an interesting story in terms of the cruising speed/fuel consumption/range equation. At a 3700rpm cruise speed of 23.4 knots, the 200hp four-stroke outboard uses only 27.7lt of fuel per hour. At 4400rpm this big Quinnie flies along at 29 knots, but still only uses 40lt per hour. These figures are aided by the soft ride the 785kg variable deadrise Millennium Hull produces across the substantial wind chop in the more open parts of the ‘Pin estuary. With a 150lt fuel tank under the floor as standard and twin 150lt tanks optional, this fishing machine is capable of long range cruising. So getting to those wide fishing grounds won’t be a problem for this big tinnie. Inside the boat the layout is fairly typical for an offshore fisher. A cuddy cabin at the pointy end, a pair of pedestal seats mounted on top of storage lockers amidships and a roomy flat deck aft. A transom door opens onto the platform formed by Quintrex’s Maxi Transom, which also features a folding boarding ladder. There’s a substantial step up to the helm area to ensure any water sloshing around the cockpit – more than likely the product of vigorous use of the deck wash than water splashing over the gunwales – stays in the cockpit before exiting through the scuppers. Water can’t run into the cuddy, wetting all the gear normally stored there. Double storage shelves along each side of the cockpit keep all the junk (sorry, gear) keen fishermen insist on spreading all over a boat, up off the floor. The helm and navigator’s seats are set high on the step up from the cockpit level. This gives excellent forward visibility, which will be appreciated by any fisho trying to sneak one of these big rigs across a shallow reef or sandbar. Seated or standing, the view through the huge wrap-around acrylic windscreen is great. This screen also does an excellent job keeping passengers and crew dry, even through the broken water out on the bar. While the test boat has no bimini top to keep the sun at bay, it’s a fair guess this will be one of the first options taken by the boat’s new owner. When perched at the helm, or seated in the accompanying passenger seat, there’s a comfy footrest. The passenger also has a grab rail to hang onto when the going gets rough. Inside the cuddy cabin the test boat only has carpet on the bunks, which the team presume makes them storage bins more than bunks. Perhaps these bunk cushions will be upholstered in the future, or made an optional extra in the production boat. Presumably there will also be a full cabin version of this hull at some stage in the future. There’s enough room inside this new 6.5m hull for full-length bunks in a longer cabin without encroaching on the fishing room in the cockpit. One thing that would improve the comfort of extra passengers is a grab rail around the gunwales. Apart from the grab rail in front of the navigator’s seat there’s precious little else to hang onto. Still being critical, the side deck covering board across the transom could also be a bit wider. It’s OK, but wider decks would support your legs better before your toes or shin hit the transom wall. There’s enough room inside the cockpit to widen these decks without impacting noticeably on internal space. There’s also a brace beside the transom door that can be a pain in the leg, if you get my drift. There’s definitely room for improving the positioning of this brace. Our test boat is also fitted with a Maxwell anchor winch. This will presumably find its way onto the options list and not come as a standard fitting. A hatch at the front of the cuddy gives good access to the foredeck for manual anchoring. It will also be easy to make your way to the bow around the cuddy once the side decks are made non-slip. To put some of these seemingly negative comments into the right perspective, our test boat is a pre-release boat. Many details of the new model are still being finalised and will all be addressed. To those of us who like offshore fishing, the actual release of the production Quintrex 650 Offshore (which should have occurred by the time this issue is available on the stands) is something we will all be look forward to. We’ll also have to wait for the bottom line, as the price is TBA. Although the Modern Boating team has been in several boats that were powered by Yamaha’s 225hp V6 four-stroke, and it continues to impress, this was our first encounter with the detuned 200hp version. As I mentioned in the main body of the text, we did experience some problems with propeller grip during this test, because the motor was mounted too high on the transom. But while this affected the boat’s handling, it did not reduce the engine’s performance. The 200hp runs as well as the 225hp version in every way. The power delivery of the Yamaha 200hp four-stroke is smooth all the way from idle through to an impressive top speed of 37 knots. This engine is notably quiet in operation and well matched to the new Quintrex 650’s hull. Yamaha’s 200hp four-stroke is identical in most specification to the more powerful 225hp version, which is a 24 valve, DOHC, electronically fuel injected V6 that displaces 3352cc.